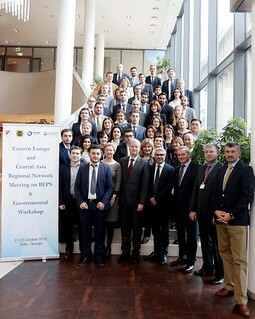 23/10/2015 - On 21-23 October 2015, the Eastern Europe and Central Asia Regional Meeting and Governmental Workshop on BEPS discussed the outcomes of the BEPS project, and how countries can engage in the implementation and monitoring of the measures adopted on an equal footing. This meeting was hosted in Tbilisi by the Georgian Ministry of Finance and the Georgia Revenue Service in cooperation with the OECD and the Intra-European Organisation of Tax Administrations (IOTA). The event followed the previous round of regional meetings on BEPS organised earlier in 2015, and in particular the one which took place on 5-6 March 2015 at the OECD Multilateral Tax Centre of Ankara. 65 participants attended the meeting and provided feedback on the delivery of the BEPS Package, as well as views on how to develop a more inclusive framework to include interested countries on an equal footing in the implementation and monitoring of the measures adopted in the context of the BEPS project. 15 countries were represented and apart from officials of the OECD and the IOTA, the event included representatives from Oxfam, the BEPS Monitoring Group, the Business Industry Advisory Committee (BIAC) and from the business community in the Region. The Georgian Finance Minister, H. E. Nodar Khaduri, Pascal Saint-Amans, Director of the OECD Centre for Tax Policy and Administration as well as Jan Christian Sandberg, Acting Executive Secretary of the Intra-European Organisation of Tax Administrations (IOTA) and the Deputy Ambassador Radu Gorincioy, Chairman-in-Office of the Black Sea Economic Cooperation (BSEC) welcomed the participants and delivered their opening remarks. Additional discussions focused on the toolkits being elaborated to target developing countries' specific needs, as well as existing and possible new initiatives aimed at building capacity for the countries in the Region. For more information, see the co-chair statement and the websites of the IOTA and of the Revenue Service of Georgia. Media queries should be directed to Pascal Saint-Amans, Director of the OECD Centre for Tax Policy and Administration (CTPA), or Valerio Barbantini, Co-ordinator BEPS and Developing Countries, CTPA.